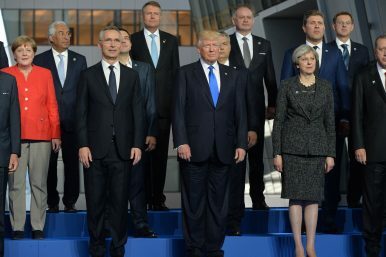 Meeting of NATO Heads of State and Government in Brussels, Belgium (May 25, 2017). Second Korean War: Would NATO Invoke Article 5? Is it time to think through the implications for NATO if war were to break out on the Korean Peninsula? With tensions on the Korean Peninsula continuing to rise over North Korea’s ballistic missile program, a retired U.S. four-star general recently argued that NATO needs to think about its role in a possible Second Korean War, including whether North Korean aggression could trigger Article 5, which states that an attack on one member of the alliance is viewed as an attack on all. Speaking at this year’s GLOBSEC 2017 Forum in Bratislava, Slovakia, retired U.S. General John Allen, the former commander of U.S. and NATO forces in Afghanistan, said that there is a hair trigger dimension to the security environment of Northeast Asia, which potentially could have wide-range consequences for NATO member states. More recently, NATO spokesperson Oana Lungescu condemned the May 14 ballistic missile test as “a new flagrant breach of a series of United Nations Security Council Resolutions, constituting a threat to international peace and security,” while emphasizing that “this is a time when de-escalation is needed, not provocation.” North Korea, however, was not an official subject of discussion during last week’s NATO summit. Furthermore, NATO member states have so far not officially discussed triggering Article 5 in the context of North Korean aggression in East Asia and a potential conflict on the Korean Peninsula. Even if Article 5 would be invoked, it appears unlikely that the European members of the military alliance would commit substantial troops to a conflict on the Korean Peninsula. For one thing, most NATO member states lack the capability to project military power in East Asia. Europe’s preeminent military power, France, operates one aircraft carrier, the Charles de Gaulle, but the ship is currently undergoing an 18-month refit and upgrade. France did dispatch a group of warships to the Asia-Pacific region in 2017, including the amphibious assault ship/helicopter carrier Mistral, where they conducted joint naval drills with the Japan Maritime Self Defense Force (JMSDF). The Mistral is carrying two British Royal Navy helicopters aboard, as well as a detachment of 60 British sailors. However, the French helicopter carrier can not accommodate fixed-wing fighter jets. Europe’s second military power, the United Kingdom, held its first-ever joint aerial combat drill with the Japan Air Self Defense Force (JASDF) in East Asia in October 2016. However, the U.K. no longer possesses a carrier force capable of supporting fixed-wing aviation. And while British Foreign Minister Boris Johnson in a speech in 2016 declared that “Britain is back east of Suez,” Great Britain’s sole remaining army garrison in Asia is in Brunei (funded by that country’s Sultan). Indeed, the entire British surface fleet consists of 19 surface combatants. Nevertheless, NATO remains engaged in a military conflict in Asia. Almost 6,000 soldiers of European NATO member states are currently serving in Afghanistan as part of the NATO-led Resolute Support Mission. Over 1,000 European soldiers have been killed so far in the conflict. Indeed, the only time NATO has ever invoked Article 5 and rushed to the aid of a NATO ally in response to an attack was on September 11, 2001. Yet, the 16-year war has put strains on the logistical capacities of many European NATO members such as Germany and remains unpopular among the European public. Japan remains NATO’s closest partner in Asia. As then NATO Deputy Secretary Alexander Vershbow said in a June 2015 speech, “Japan is NATO’s most senior partner, having started political consultations in the early nineties.” Japanese Prime Minister Shinzo Abe has repeatedly called NATO and Japan “natural partners.” The Japanese prime minister and the then-NATO secretary general signed a joint political declaration outlining a framework for NATO-Japan cooperation in 2013. Among other things, Japan is considering joining a NATO missile development consortium, which would deepen defense industry cooperation between NATO member states and Japan. As I explained previously (See: “What Would the Second Korean War Look Like?”), the United States, South Korea, and Japan will ultimately prevail in any military conflict on the Korean Peninsula and there is no real need for European military support. From a diplomatic standpoint, raising the issue of Article 5 in the context of a possible Second Korean War could even be counterproductive, John Delury, a professor at Seoul’s Yonsei University’s Graduate School of International Relations, said in an interview with The Diplomat. Active deterrence could be deployed against North Korea’s ballistic missile tests under specific conditions.